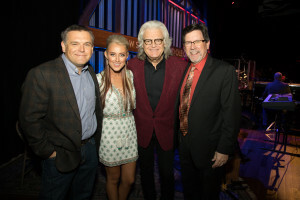 Brooke Eden fulfilled a lifelong dream to perform at the Grand Ole Opry this past Saturday night (Nov. 19). Eden made her debut on the historic Ryman Auditorium stage for Opry at the Ryman alongside legendary Country artists Bill Anderson, Ricky Skaggs, Connie Smith and Ray Stevens. The vocal powerhouse rocked a performance of infectious girl-power anthem “Diamonds” and flexed her pipes on Hank Williams Sr.’s “Lovesick Blues,” returning to the stage for a second show the same night. Eden’s current single “Diamonds” is rising at Country radio and is featured on her debut EP, Welcome To The Weekend, available now.